Around 900 people joined the annual Diocese of East Anglia pilgrimage to Walsingham on Bank Holiday Monday, May 7, which took on a new format in record-breaking temperatures. The pilgrimage began at the Catholic National Shrine of Our Lady of Walsingham, rather than in Walsinghams Friday market place, with a Pontifical Mass of Our Lady of Cana held in and outside the Chapel of Our Lady of Reconciliation in bright sun and a record-breaking temperature of 25 degrees C.
In his homily, Bishop Alan welcomed a large group of young pilgrims who had walked across the Norfolk countryside to Walsingham after attending the Ignite Festival in Swaffham. He went on to speak about the Ark of the Covenant which was, for the Jewish people, the one and only dwelling place of God on earth among his people. When Mary carried Jesus in her womb, she became the House of God the Ark of the Covenant. No house can ever be given to God which is more beautiful or worthy than his Mother, said Bishop Alan. But when we have received the Eucharist of the Body and Blood of Christ, we too become a beautiful house, a beautiful ark, tabernacling God in our very souls and bodies. We are commanded at the end of Mass to go out and to be the presence of Jesus in our world, to proclaim his Gospel and to live as those who have experienced the love and mercy of God. We are to commit ourselves to love and serve the people of our world and especially those who are the neediest in our society, said Bishop Alan. After Mass, groups from across Norfolk, Suffolk, Cambridgeshire and Peterborough enjoyed their lunches in the grounds of the Shrine before Bishop Alan performed the traditional crowning of the statue of Mary. 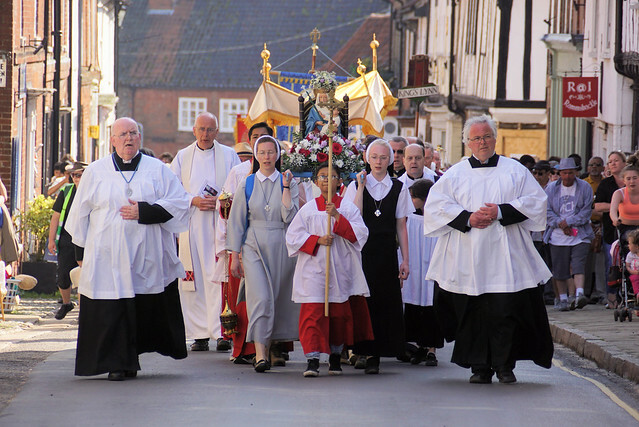 Most pilgrims then joining a Blessed Sacrament Procession to the Priory grounds in Walsingham along the Holy Mile, while others went in coaches. On arrival at the Priory grounds, the Blessed Sacrament was placed on the altar and Bishop Alan gave Benediction and then led devotions at the original site of the Holy House which contained the image of Our Lady, before it was destroyed at the time of the Reformation. This included a prayer for England and singing the Lady of Walsingham hymn. Click here or see below for a full picture gallery of the Walsingham Pilgrimage.